Warn people ahead of time that you’ll be asking them to put away their phones for the meal. Yes, it might seem crazy to have to do this, but it could save you some awkward moments and confused stares. We’ve provided a sample email below that you can use, in case words fail you. Get a basket or attractive box that can hold everyone’s phones. Optional: place the printable DEVICE BOX SIGN on your basket or box—just in case anyone didn’t get the message. Take a photo of your guests. 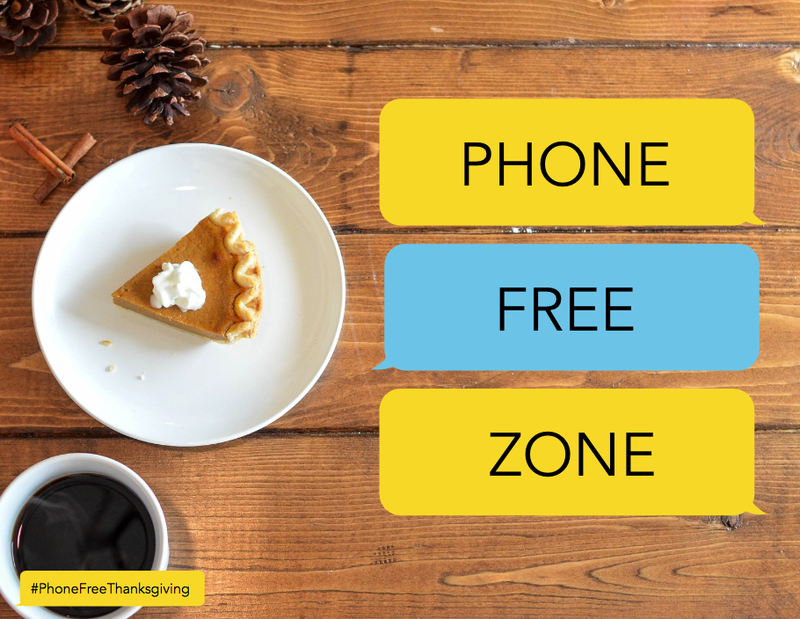 (Optional: ask someone to hold a copy of the #PhoneFreeThanksgiving sign and/or their Gratitude Name Tags—both are included below). Then put your own phone away, too! Eat dinner. Converse. Connect. Give thanks. A few days after Thanksgiving, we’ll send you instructions on what to do with your photo, plus additional resources to help you survive the holiday season. 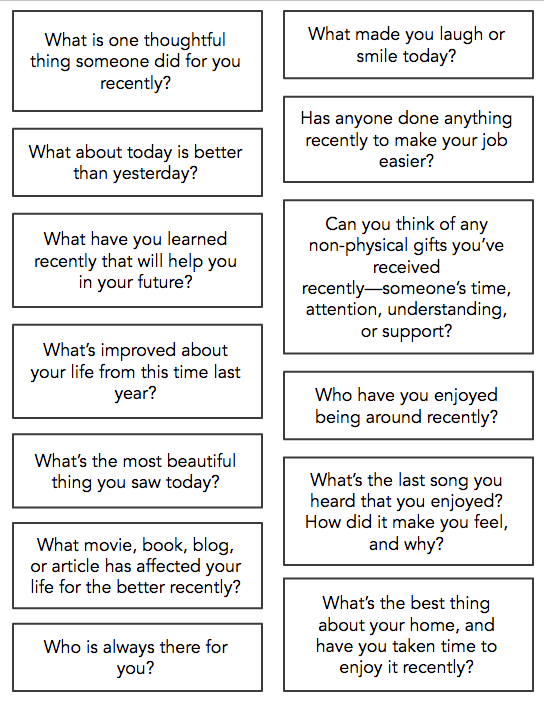 Printable GRATITUDE CONVERSATION PROMPTS: You can put one underneath each person’s plate and then have people discover them during the meal, Oprah-style, or put them into a jar or basket that you can pass around during the meal. Feel free to add your own! Printable GRATITUDE NAME TAGS: You can hand these out right when people arrive, or wait till you’re all sitting down at the table. Either way, be sure to provide pens so that people can fill them out. Shareable SOCIAL MEDIA BADGE: The more people participate, the better. Use this social media badge to tell people what you’re doing and invite them to join you. Just remember: no social media at the Thanksgiving table! Printable PHONE-FREE ZONE SIGN: Want to go even further? You could designate a room (or even your whole house!) as a no-phone zone. Hang these up, and you’ll turn your house into the equivalent of the Quiet Car on Amtrak: you’ll clearly communicate (without confrontation) that you would like to spend quality time together with your guests, instead of having the afternoon drift away as everyone loses themselves in their devices. Right-click on the images below to save, share and/or print your survival kit.